Battery Saver helps you keep going on a low battery by automatically restricting mobile data until the next charge. Some apps and services won’t work unless you’re connected to a Wi-Fi network. 1. Swipe the status bar down with two fingers and touch . 2. Battery Saver and turn it on. When the phone is in Battery Saver mode, the top (status bar) and bottom (navigation buttons) of the home screen turn red. You can get detailed information about what level of charge your battery has, how much time remains on current charge, and recommendations on how to adjust your settings to maximize battery life. 1. Go to Settings > Battery. 2. You'll see a list of items using battery power. Touch an item to see detailed information about its usage and, where applicable, adjust settings to reduce its usage. 3. Touch the battery history graph to see more details about how power-intensive activities are using the battery. 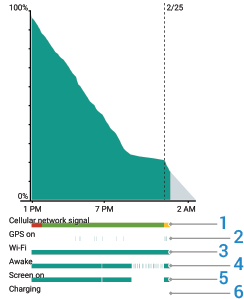 For example, the following graph shows that an extended period of heavy use, with the screen on continuously, discharged the battery faster than normal. If the signal strength is poor or worse, move to a location with a better network signal or use Wi-Fi for data. Tip: A weak network signal can also cause static on calls, one way calls, dropped calls, connectivity and data issues, slow performance, and other issues. Even if your geographic area has good network coverage, building walls, underground locations, dead spots in coverage, and other environmental factors can impede the signal. In this case, move near a window or use Wi-Fi. 2 - GPS - Blue indicates that GPS was on. When possible, charge your phone while using GPS. 3 - Wi-Fi - Blue indicates that Wi-Fi was on, but not necessarily connected with a Wi-Fi network. When possible, use Wi-Fi for data. 4 - Awake - Blue indicates that an app was preventing the phone from going into sleep mode when idle, usually to complete some task. However, some user-installed apps can drain the battery by keeping the phone in awake mode longer than necessary. 5 - Screen on - Blue indicates that the screen was on. If this is draining your battery, decrease the screen timeout (inactivity before your phone sleeps) to 1 minute or less, set screen brightness to automatic, limit live wallpapers, and press the Power button to turn off the screen when not needed. Consider charging your phone during heavy use, particularly when using games or apps that use frequent background data. 6 - Charging - Green indicates that the phone was charging.